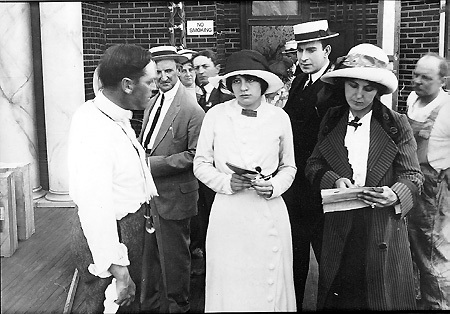 Marguerite Snow (center) possibly holding a script for THE GIRL OF THE CABARET. Looking over his shoulder at left is Riley Chamberlin. Notes: 1. The Thanhouser advertisement in the August 9, 1913 issue of The Moving Picture World listed an erroneous release date of August 6, 1913. 2. As evidenced by a print preserved in The National Film Archive (London), Marguerite Snow possessed no talent as a violinist; she is seen sawing the bow in a very mechanical manner, without finger movements on the strings. "A young girl, who had talent as a violinist, came to New York determined to win fame on the concert stage. She found the field overcrowded, but accepted an engagement as violin soloist in a cabaret restaurant. She was pretty and her playing pleased the patrons of the place. One evening a roughly dressed man came into the restaurant. His attire was in sharp contrast to the foppish men in evening dress who were languidly eating their meals. When the young violinist made her appearance the countryman showed by his manner that she had made a deep impression upon him. He came evening after evening to the restaurant and finally made her acquaintance. His interest in her was not the superficial, selfish attention such as the girl had received from her Broadway admirers, and the little violinist soon realized that he loved her and she returned his love. They married and went to his farm to live. "They were ideally happy for several years, and then the glamour of their love passed away and the girl longed for her former life. Her husband strove in vain to cheer her. Finally she left him, taking her little girl with her, and returned to New York to make her way in the world alone. Her violin playing lacked the spirit of former years, and she failed to obtain engagements. She would have been in dire need if her little daughter had not made a success on the stage. The two lived in comfort, but the woman was unhappy, for she missed her husband and longed to return to him. A May Day party for theatrical children was held in Central Park, and the child attended it with her nurse. The youngster ran away from her guardian and ran into a stalwart man who was walking sadly along. It was the husband and father, who had come to New York to find his loved ones. He recognized his child with joy. Together they went to the lonely woman, and the little family was reunited, never to be parted again." "Marguerite Snow is featured in The Girl of the Cabaret. The story does not allow her sufficient opportunity, and the production, on the whole, is not one destined to set the world on fire." "There is seemingly a perennial interest in this type of story, wherein a young man weds a girl from the music hall. She afterwards leaves him, only to find that the place has lost its charm and is glad when he discovers her and takes her home. Harry Benham and Marguerite Snow, assisted by the Thanhouser Kidlet, work this story out in a very attractive and appealing manner."